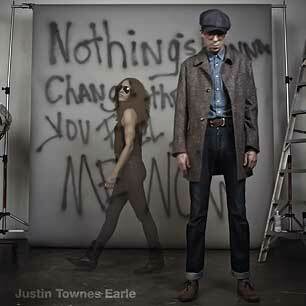 See the gallery for quotes by Justin Townes Earle. You can to use those 5 images of quotes as a desktop wallpapers. You have to live what you write, or you have to know it. There are exceptions, like story songs, where you just have to have your facts straight. But I think you don't have to live a hard life to be a good or interesting songwriter. 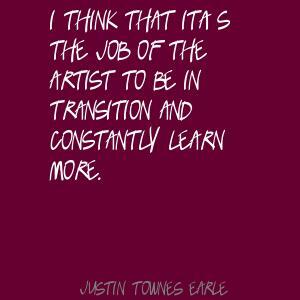 I think that it's the job of the artist to be in transition and constantly learn more. 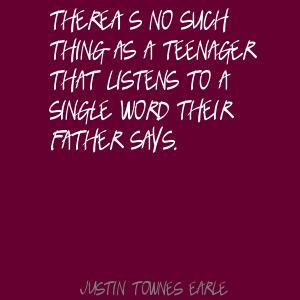 There's no such thing as a teenager that listens to a single word their father says. I always watched movies and rooted for the bad guys, you know? I've always been that kind of guy. I still hold some respect for criminals that are good at their jobs. All my records have been written to be records, rather than writing a group of songs and seeing if they fit together. I got a feeling that when I have kids, I'm going to have a little girl, and she's going to be completely sensible. I know I'm never going to be a big pop star, because I'm not willing to conform. I love Motown, but I've obviously always been more of a Memphis soul fan. If it's Stax or Motown, I go Stax. I think a lot of men are afraid of pretty things, and I'm not, I like pretty songs. I try and eat good. On the road, that's next to impossible. And we eat a lot of unhealthy things when we're in Texas - that's what you do there. I've got a 27-inch waist. Before, I was stupid smaller. Finding clothes in the South was impossible. I've never been good at rock'n'roll songs, anyway; either I'm blessed or I'm cursed, but whatever I write comes out sounding old. My parents split up when I was about 2. I realize more and more how much I'm like my father. My gentleness comes from my mother. Nashville's like any other hometown - after a while, it's stifling. On the road, I weigh 168. At home, ten more. There's a certain urgency that comes from the records of the early 60s before overdubbing and multitracking came into play. Much more quotes by Justin Townes Earle below the page. I didn't get into music to become a blues musician, or a country musician. I'm a singer-songwriter. In my book that means I get to do whatever I want. I discovered the same thing Gram Parsons did, that soul music and country music are practically identical. Based off of the same chord structures, and the songs are of heartache and loss. The main connection is they both came up in church. I grew up in a racially mixed neighborhood. So going over to friends' houses for dinner, their parents listened to Al Green and Luther Ingram. It was something that hit me early on, the feeling that came across. I heard Nirvana, and discovered that songs could be like poetry, but a little bit more refined: you didn't have to have 20 verses to get your point across. I think the best thing an artist can do is not hang out with other artists. I really dislike hanging out with musicians, for the most part, except for a few select friends, because I don't like to talk about music all the time. I've always written. When I was in school, the only teacher who ever liked me was my creative writing teacher. I used to enter poetry competitions, and I don't think I ever lost one. So I had the idea for a while of being some kind of poet. It's nice coming to Nashville, and we have four-bedroom house and a dog, and we go swimming a lot. We get down here and spread out a lot, and I miss my sweet tea and my cornbread and my good southern cooking - but I'm down here eating pretty for two weeks and I'm ready to go back to New York City. New York has always had a love for Southern artists. There's no place else that makes me feel like the city does. I just love the immediate nature of the city, you can get whatever you want whenever you want it and do whatever you want whenever you want to. What I'm doing is basically the same as Bob Dylan did with folk songs and Woody Guthrie songs, the same as folk music's always done. I'm not going to sing about ploughing, but I'll write a song that sounds like it should be about ploughing.